A coastal view of Somalia looking northeast from Mogadishu in the foreground to Raas (Cape) Xaafuun at the horizon. 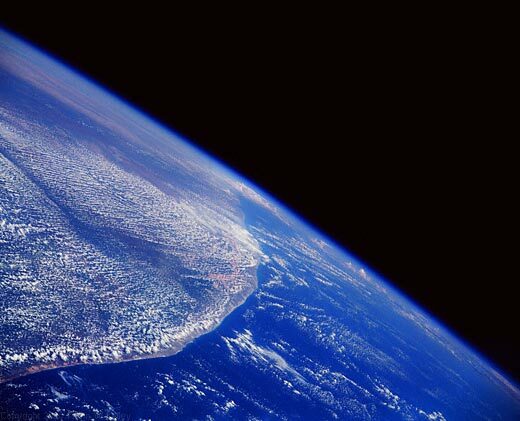 Thin cumulus cloud "puffs" cover the Somali Desert., the long area of fewer clouds. 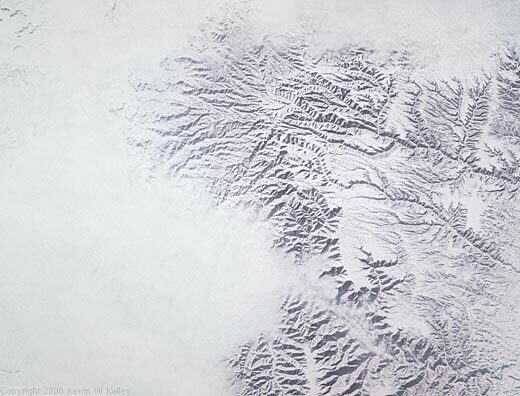 The Roan Cliffs and East Tavaputs Plateau stand out through snow cover in the Desolation Canyon area along the Green River of Utah. The uplift of the Roan and Tavaputs area in the recent geologic past caused the river canyons to dig deeper. Sunlight diffused in atmospheric haze glints off the Indian Ocean with a warm, golden light. 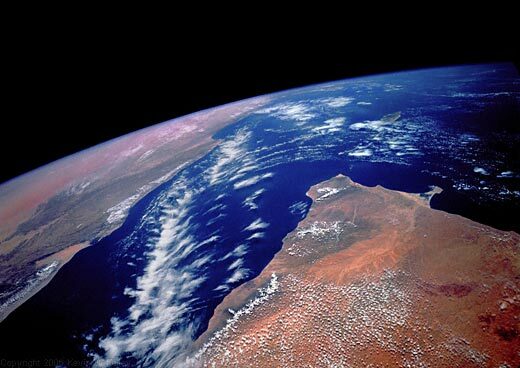 View of the Saudi Arabian coastline and Indian Ocean. The red area on left is the Saudi Arabia Al Kidan dune field. 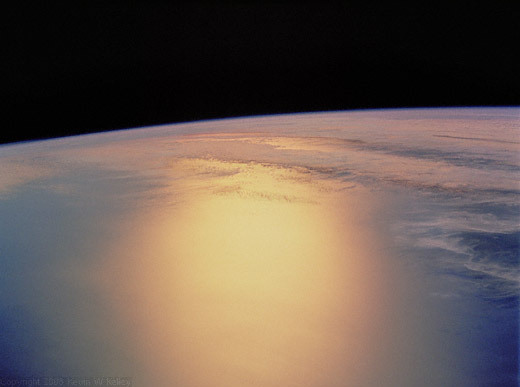 Photograph of dawn taken from manned orbital complex Soyuz 26, December 1976. 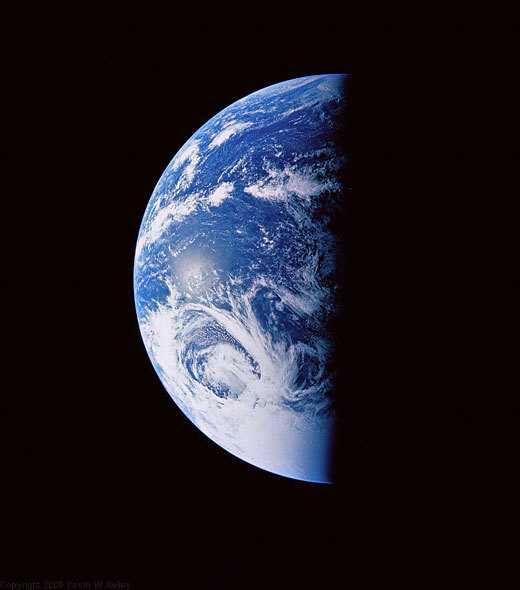 Photo taken by Cosmonauts G. Grechko and Yu. Romanenko on board the space station, Fotokhronika TASS. 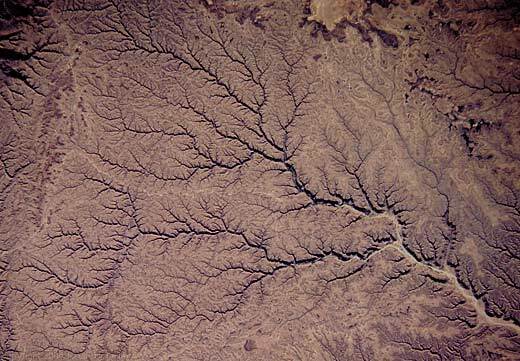 The deeply etched patterns of intermittent streams in the Hadhramaut Plateau of South Yemen. These stream beds, which now rarely carry water, are deeply entrenched, owing to the geologically recent uplift of the plateau. 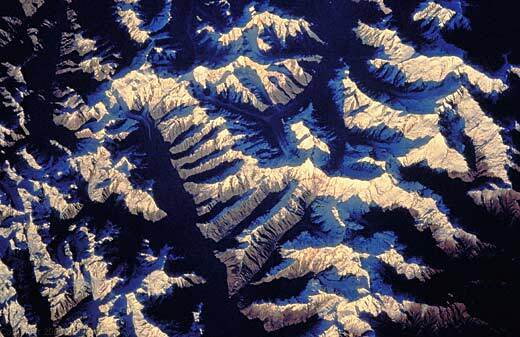 Nonetheless, a very distinct watercourse appears along the top and bottom edges of the image. In the photograph's upper portion, available water will flow into the vast emptiness of the Rub al Khali (Empty Quarter). In the lower portion, water will flow to the Gulf of Aden. A tongue-like cold front moves rapidly over the warmer Indian Ocean interacting in a dance of energy and moisture. 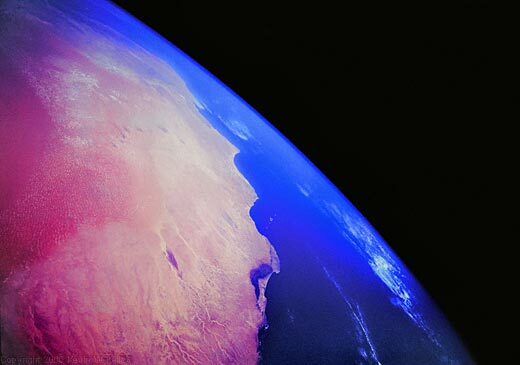 The Horn of Africa juts northward separating the Gulf of Aden (left) from the Indian Ocean, right. Rass Xaafuun peninsula extends into the Indian Ocean on the east coast of Somalia. 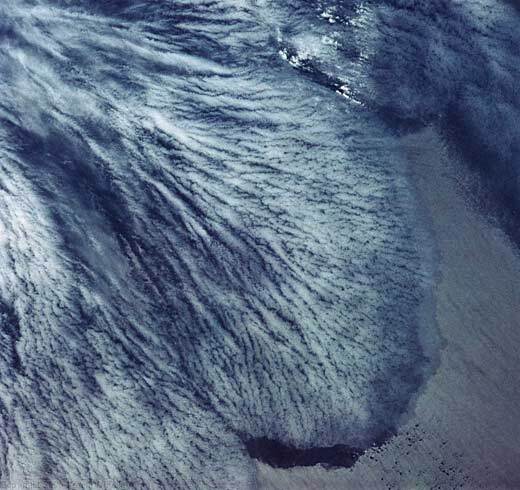 A band of cirrus clouds drifts across the Gulf of Aden towards South Yemen which is seen in the center left of this photo. Snow-capped Hiimalayan peaks stand out prominently in the late evening light. 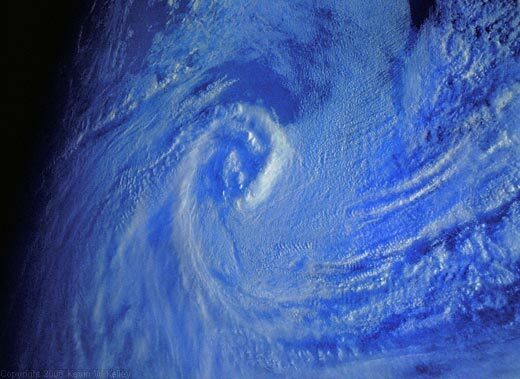 A clearly defined vortex over the Indian Ocean, 500 miles west of Australia. The line of light/dark, caused either by the sunrise or the sunset, is called the terminator. The edge of the Earth, or the horizon, is called the limb. In this photograph, limb and terminator blend near the top.